Over the time I’ve been writing my permaculture blog, some 15 months now, the style has changed and I’m more likely to be writing light-hearted accounts of life in our little corner of Northern France than expounding theories of permaculture. There are many other better qualified sources if you need to know how to do something properly, permaculture-wise, but I hope our stumbling progress leaving a trail of errors behind helps in some way: a “Beginners’ Guide to Permaculture” written by beginners, rather than experts. A writing friend of ours, Mark Sampson (who achieved fame when his straw-bale house build was featured on UK TV Channel 4’s Grand Designs Abroad programme) has written an article about us, “Tilling a Foreign Soil”, which has just been published in October’s edition of Country Smallholding. The article finishes with links to Marks new book, Essential Questions to Ask when Buying a House in France, our gite for rent and this blog. Thinking that this might attract some new smallholding or aspiring-smallholding readers to our blog, I thought I’d better write about permaculture. Just raising chickens, growing vegetables and chopping wood for fuel, for example, doesn’t make us permaculturists. In fact, living as we do in the countryside, many of our neighbours are doing similar things without having heard of the term “permaculture” and, with years more experience, are often doing it better, at least more productively. Permaculture is a design system. When it was originally conceived, it was along the lines of producing an edible ecosystem. Compare a field of cultivated wheat that neighbours an established woodland. Particularly at the edge of the wood, there will be a great variety of plants, shrubs and variously-sized trees, adding a huge amount of biomass over the year, with not a finger lifted; the wheat field also produces a large amount of biomass but it is intensively worked: ploughed, harrowed, sown, sprayed with herbicides and pesticides and then harvested. With the wheat field, however, a large part of the biomass is edible, much more than the woodland. If we planted up a woodland with edible plants and shrubs, soft fruit, top fruit and nuts, then we could vastly increase the proportion of additional biomass that is edible and, after initial planting, with little management needed other than the harvesting. This “pure” form of permaculture is best illustrated by the concept of a forest garden. Out of that has grown the concept of design permaculture, where the elements that make up an ecosystem such as beneficial relationships (think of bees pollinating plants while feeding, as an example) are used in the design of say a house, garden or even farm. Inputs and Outputs are evaluated so that the output of one system within the overall design becomes a useful input of another element, rather than just a waste product to be disposed of. Recently, we’ve been stretching this idea to combine with our neighbours. This year, the apple trees are heavy with fruit and our neighbours, Alan and Carole, are clearing up windfalls from their garden daily. 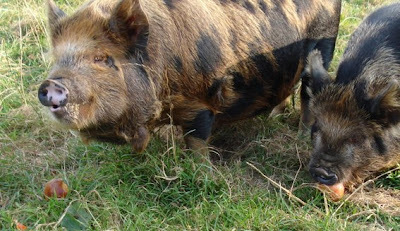 These “outputs” are going straight into our greedy pigs (see photo above). We’ve recently had some trees pruned by Duncan the tree surgeon and hadn’t the time to deal with the prunings (due to my impending operation). 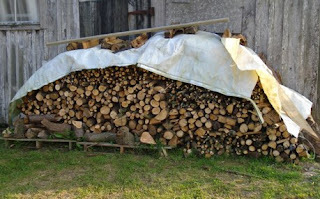 Alan provided the labour and turned these “outputs” into free firewood and kindling for himself and Carole. Our task, over the coming months and years, is to design in as many networks of beneficial relationships as possible into our permaculture smallholding. Time will tell, as this is experimental and we’re very much beginners!